NeuLife Rehabilitation is honored to serve Veterans. As a registered residential treatment facility through the VA Choice Program, and an organization managed and operated by many Veterans, our dedication to serving those who’ve served our country runs deep. Our services for Veterans range from residential inpatient rehabilitation to tailored outpatient services. At NeuLife, the focus is on community integrated rehabilitation designed to help each Veteran reclaim their life and reconnect with their family, friends and community. 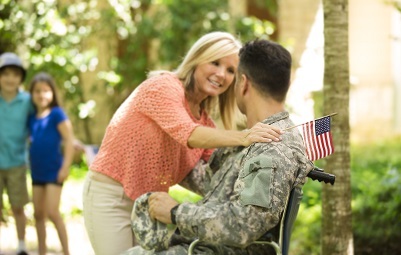 NeuLife applies evidence-based therapies to help Veterans achieve a purposeful recovery. 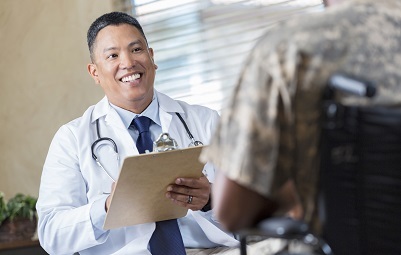 Our individualized post acute rehabilitation programs address brain injuries, spinal cord injuries and other catastrophic injuries acquired in military and non-military settings. Customized treatment plans are developed to address the injury and long-term psychological and coping challenges. Our programs are guided by an interdisciplinary team of clinical experts with years of experience in a diverse range of rehabilitation and neurorehabilitation specialties. This multi-faceted approach helps Veterans & Military personnel regain daily living skills necessary for an independent life and a successful community reintegration. Our specialized post-acute rehabilitation focuses on the unique challenges of each patient. In addition to individualized treatment, we also work closely with the family to address issues that may affect the family as a whole. We proudly accept referrals from the Veterans Administration (VA). In addition to VA Choice, we also accept TRICARE. We are accredited by the Commission on Accreditation of Rehabilitation Facilities (CARF) for Brain Injury Specialty Programs and Residential Rehabilitation. The therapies at NeuLife are outcome-driven and designed to improve functional independence. Patient outcome data indicates that we consistently achieve excellent outcomes and high patient satisfaction.